← Lloyds List – Monday 11 August 2008. 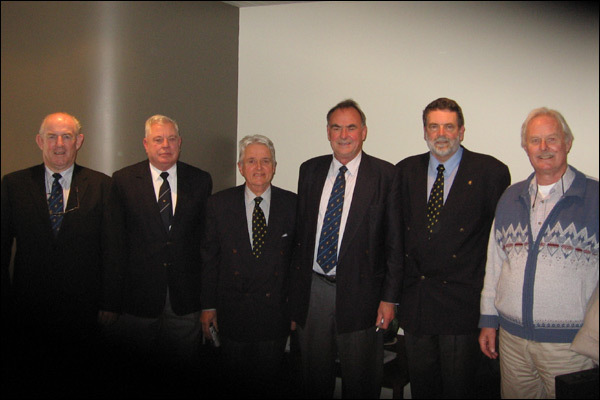 The 2008 Annual General Meeting was held in Wellington on 13 August 2008, at which the Master presented his report. Our membership as at 31 March shows a reduction of three from last year. Four new members joined in the past year and I welcome Kees Buckens and Stewart Irvine (Auckland), Peter Albury and John Cleaver (Christchurch). The consolidated accounts are similar to last year. The assistance of the Transport Accident Investigation Commission with costs associated with the publication of On Deck helped increase the “head office” funds. The executive can see no reason to vary the present levy level. Reports from the General Secretary have been circulated on a 3 monthly basis as required by the rules. Branch Committees have met regularly and minutes received by the General Secretary. Branch Newsletters have been received by the General Secretary from all Branches on a regular basis. We also receive newsletters from kindred organisations in Canada and Australia. The second edition of the revised “On Deck” was distributed last September and it is hoped that the next issue due out next month will be even better. The Company web page is slowly building and being used by the Wellington and Christchurch branches. The small setup cost was mainly to obtain a digital copy of our crest. It is interesting to note that our crest was designed by a member in the 1950’s. There are no ongoing costs for this web site through the kind generosity of my son. It is interesting to note that most articles are picked up by Google within a few days of being posted. Last November I attended the launch at Parliament of Sea Change. Sea Change is a discussion document prepared by the Ministry of Transport and which signalled the government’s strong commitment to a revival of coastal shipping. The General Secretary and I attended a function at Government House Wellington in June with representatives of the 150 organisations in New Zealand with Vice- Regal Patronage. At this function the Governor General’s new official standard was launched. As mentioned above, last year the Government promised financial assistance and support for the rejuvenation of coastal shipping. Coastal shipping is described by different organisations in different ways. To the general public it describes ships that trade coastwise regardless of ownership or the nationality of the crew, to the workers unions it is a ship that their members work on and to flag state authorities it is ships that fly the flag of their country. In New Zealand the generally accepted term coastal fleet has shrunk to 13 ships made up of New Zealand and foreign owned ships flying New Zealand and foreign flags manned by New Zealand citizens and others who have acceptable qualifications. Our fleet of 13 ships is generally aged and the majority of the Cook Strait ferries would not be permitted to operate in some European countries because of this – a far cry from the situation in this country 30 years ago when we had some of the most advanced ships in the world. If new ships do materialise, who will man them? There are already shortages of experienced personnel. On the job training has almost disappeared and those that have been trained in this country have disappeared overseas where the rewards are much higher. This will probably herald an era of reduced experience and qualifications to enable the ships to be manned. Today, who in their right mind would go to sea? We read that Captain Chawla of the tanker HEBEI SPIRIT is still in detention in South Korea despite having been found innocent of violating pollution laws and may have to stay at least another year until the appeals process is complete. If the Korean authorities aim was to cripple the morale of this seafarer and at the same time deter young people from going to sea, then they should be congratulated for a job well done. It is not possible to say how much emotional damage has been dealt him and his chief officer by authorities’ intent on finding scapegoats. Captain Chawla said the process of questioning and unpicking, in minute detail, every decision he made before, during and after the incident had left him unsure of his command and if he ever returns to sea again his future actions will be based on how they would be interpreted rather than just doing what is right. In Greece last month, the guilty verdict handed to Captain Laptalo of the reefer ship CORAL SEA must cause much unease in the maritime world. The master appears to have been convicted on the basis that as only a small number of people, including him, would have knowledge of the ships cargo plan, only this select few would have been in a position to identify which three boxes of bananas in a cargo of 200,000 boxes contained drugs. There seems to be a belief amongst prosecutors that the master is fully aware of all that is carried and all that happens on aboard a ship. There is of course a traditional view that a master bears full responsibility for all that happens while he is in command. While this is stretching a point in matters of navigation or engineering, where junior officers assume delegated responsibility for the master, it is even more far fetched to suggest that the master has direct responsibility for detailed cargo stowage. Closer to home the Master/mate of a Cook Strait Ferry was prosecuted for operating a ship in a dangerous manner. A number of aspects of the case highlighted a culture then present in Maritime New Zealand of blame and prosecute. The defendant was acquitted on two counts of operating a ship in a dangerous manner but found guilty of not reporting the incident. This was s strange decision because if there was no incident what was he to report. He appealed to the high court and the conviction was set aside. Part of the argument against conviction was the duty to report incidents rests with the master and it was shown that legally he was not the master at the time. Maritime New Zealand is appealing the decision. When 24 hour operations of the Cook Strait ferries started in 1993 a problem evolved in that the master could not delegate his authority to the mate in pilotage waters as the rules had been changed to only allow a master in command to use a pilotage exemption. This seemed a strange rule as the masters authority has been delegated since time in memorial – how else could ships go to sea for more than 12 – 18 hours, how could ships sail down the English channel in thick fog for 2 – 3 days, traverse the Australian barrier reef, sail down the St Lawrence seaway or the Malacca Straits and there must be many other areas in the world where the presence of the master on the bridge for the whole time is impossible and his control is delegated. In New Zealand the solution for NZ Railways was to appoint two masters – one senior and one junior. The senior master made up the night and standing orders and told the junior master to call him if necessary and in my experience this happened on a number of occasions. Recently I believe the Railway management have said that both masters are of equal standing. Strait Shipping on the other hand overcome the problem by only having one master and a “mate/master’ who was in effect the junior master. The case was reported by the mate/master but the rules say the master must report and so the appeal was upheld. In my opinion neither of the present solutions is good. The law should revert to what it was prior to 1952 which allowed a suitably qualified person (usually the mate) to also use an exemption. This would mean that there is only one master; there would be no doubt of who that was and where the responsibility stopped 24 hours a day. It would certainly stop the practice of crew members and ship owners or operators of playing one master off against the other. It is an interesting case because there are many who say there can only be one master on a ship at any same. Certainly in most organisations there can only be one person at the top – most run by committees fail. Our organisation is in good heart socially, but we should make our presence felt more in the shipping industry. Collectively we have a lot of experience and when reading of the numerous accidents still occurring, experience appears to be the major factor that is missing. Experience can only be achieved by on board training. The vagaries of the weather can only be appreciated by experience and the weather can affect even the largest ships as has been demonstrated on more than one occasion recently. In closing I wish to record my thanks to Ken Watt for his support and work as General Secretary/Treasurer and to the various Branch Wardens, committees and newsletter editors for their continuing efforts.